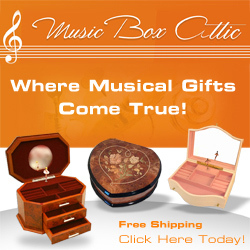 Music Box Attic is a leading online site for gifts and collectibles. From jewelry boxes, traditional music boxes, ballerina music boxes and specialty items there is sure to be the perfect gift idea for someone special. I had been searching for a new jewelry box and my husband thoughtfully presented me with a lovely gift at Christmas. Unfortunately, it wasn’t exactly a jewelry box although I do treasure it since he had the best of intentions. Still needing a jewelry box, Music Box Attic had a wide variety of options available for me to choose from and I found exactly what I was looking for at the perfect price point! I love the Spacious Cherry Musical Box-Shannon by Mele & Co. which has an elegant classic design and a lot of room to store your jewelry. There are two necklace doors with three hooks each and a catch panel which has come in very handy when my necklaces have slipped off. In the top compartment there is a ring roll and two additional open areas for pins, stud earrings etc. 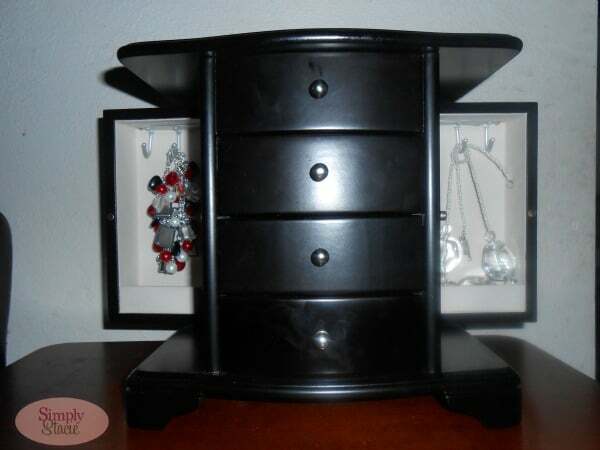 It also has three generously sized drawers that are perfect for bracelets and watches. 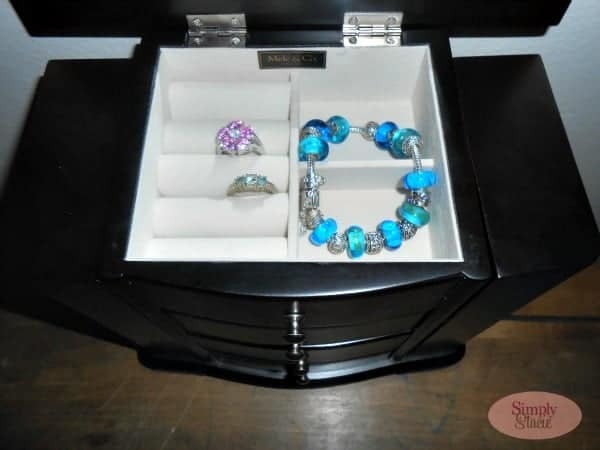 My favorite feature is the lift up lid with mirror which really elevates this jewelry box to a product that I use every day when putting on my jewelry instead of merely using for storage. I love the attention to detail in this Mele & Co. musical jewelry box including a stunning cherry finish, a footed platform base and the hand lined suede fabric lining. My six year old daughter loves sitting with me when I am putting on my necklace and winds up the music box to listen to the soothing music sounds while playing dress up. I appreciate the attractive pricing as the SRP of the Spacious Cherry Musical Box-Shannon is $110 but it is available for purchase from The Music Box Attic for only $79.99! I am planning to surprise her on her birthday with another fabulous product from Music Box Attic, the Contemporary Java Musical Ballerina Jewelry Box-Angelica by Mele & Co. ($64.99). You are invited to visit Music Box Attic to browse the entire selection of wonderful gift ideas or find a new jewelry box or music box to update your jewelry collection. Connect with Music Box Attic on Facebook and Twitter too! That looks very nice! I don’t have a jewelry box…I keep them all in organza baggies stuffed in another bag. Probably not a good way to care for my jewelry i’m sure! I had never heard of this company before. Really beautiful craftsmanship. What a beautiful jewelry box, and functional, too! I love these music box it nice to get little girls into these! I need something to hold all the long necklaces that I own. I have quite a collection. I really like this site! Great stuff, thanks for sharing.